Congratulations on a GREAT, GREAT night of proper blues, it was a superb night.When you get one like that, it makes all the hard work, all the disappointments and all the financial worries worth while, I know I have been doing it for 19 years.I really enjoyed the whole gig, you have an excellent room and the sound was superb.Doc Brown, Dave & Dana Dixon, Martin and Kevin were excellent and James Harman out of this world, I have been a huge fan for many years.Please pass on my congratulations to the rest of your committee, they made everyone very welcome. do it again. Cheers, James. A darkened room with candles flickering on the tables, people sittingcomfortably with a drink and nodding their heads to the beat. Yep, the Redcar Rhythm & Blues Club is exactly how I'd imagine a Blues Club to be, aside from the lack of smoke (which is a shame, but maybe I've watched too many films). I finally managed to pay a visit a couple of months ago, when The Ramon Goose Band from Colchester were playing, supported by a band called Mojo Hand. It all started off well, nice friendly people, drink in hand and great music (we're talking guitars, drums, harmonica and saxaphone here...all on one stage! A really good vibe in the room). I couldn't believe I'd been missing out on this little feast for the senses all this time! I mean, it's right here in Redcar (Val's Priory - Just behind the Bus Station) and on my doorstep! get a free CD for my efforts. The next one is on Saturday 22nd October with The Spikedrivers plus support from Snakewater. It's £9 a ticket but I tell you, it's well worth it (and this is coming from a skint student). You're wondering what's the catch? 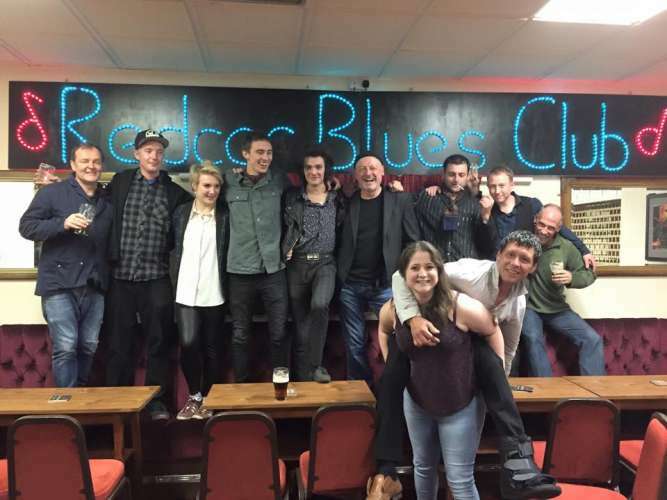 What's Redcar Urban Arts got to do with this Blues Club? Well Ahhaha...but of course we have designed their T Shirts!